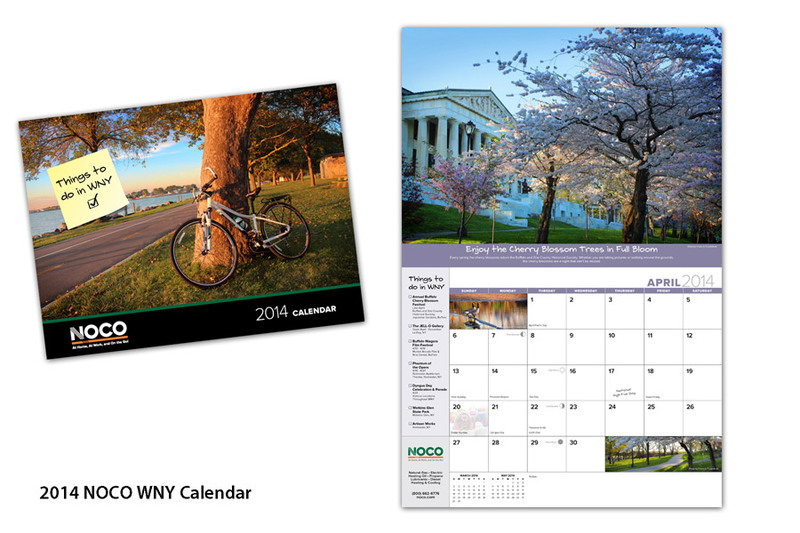 For this calendar I had gone to various locations around Western New York, such as Buffalo and Rochester taking photos of landmarks. 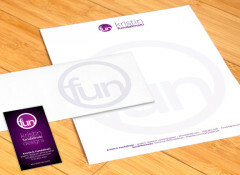 This was an exciting project for me as it renewed my love for photography. 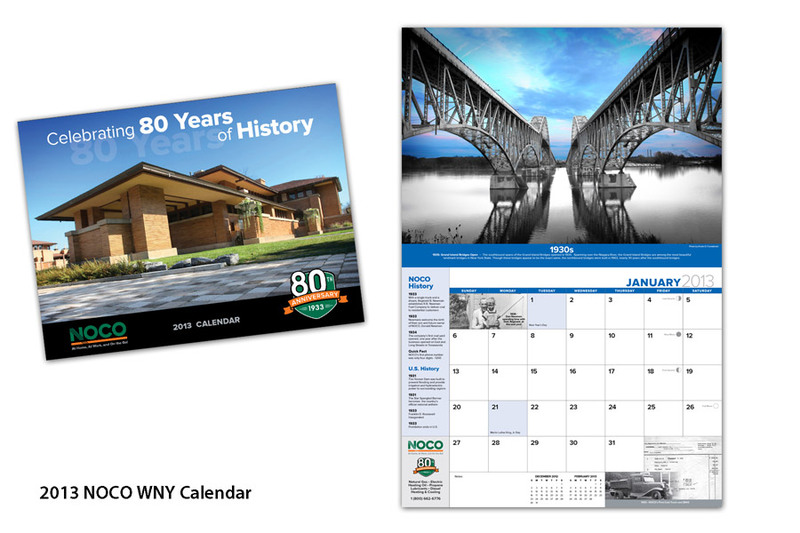 Since 2013 was NOCO’s 80th Anniversary, the task was to create a calendar that wasn’t so NOCO driven that it turned customers off. 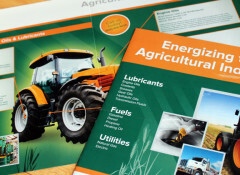 The direction I chose was to have local based images featured, and then NOCO images through the years be secondary. 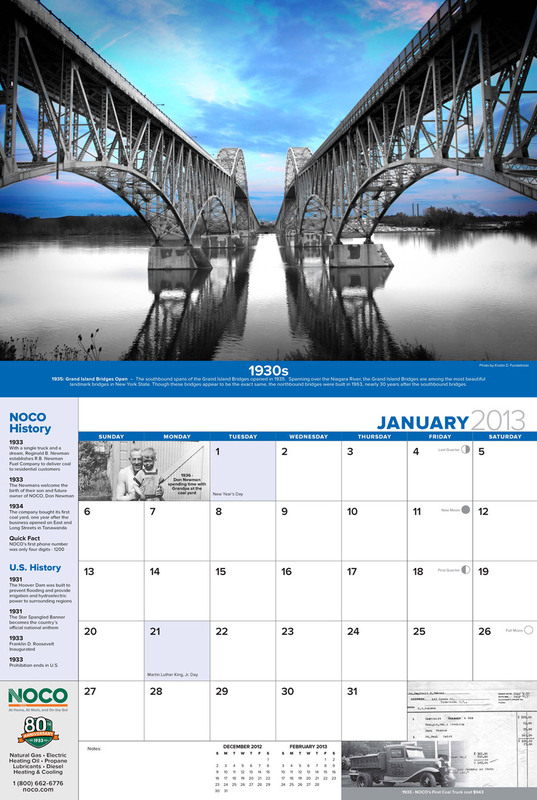 Each month featured a different decade and NOCO images relating to that decade. 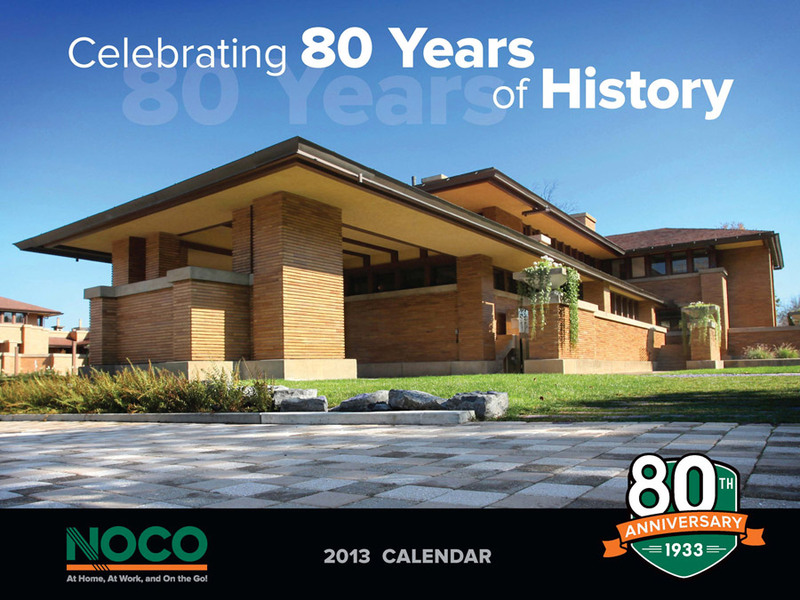 Front Cover – I had photograhed the Frank Lloyd Wright Darwin Martin Home in Buffalo. I love taking interesting angles of buildings. For this one I was lying on the ground to get this angle. Grand Island South Bridges – I was really proud of this photo. I was almost standing in the river to take this shot. It was such a dynamic shot that I decided to take out most of the color, and enhance just the sky. 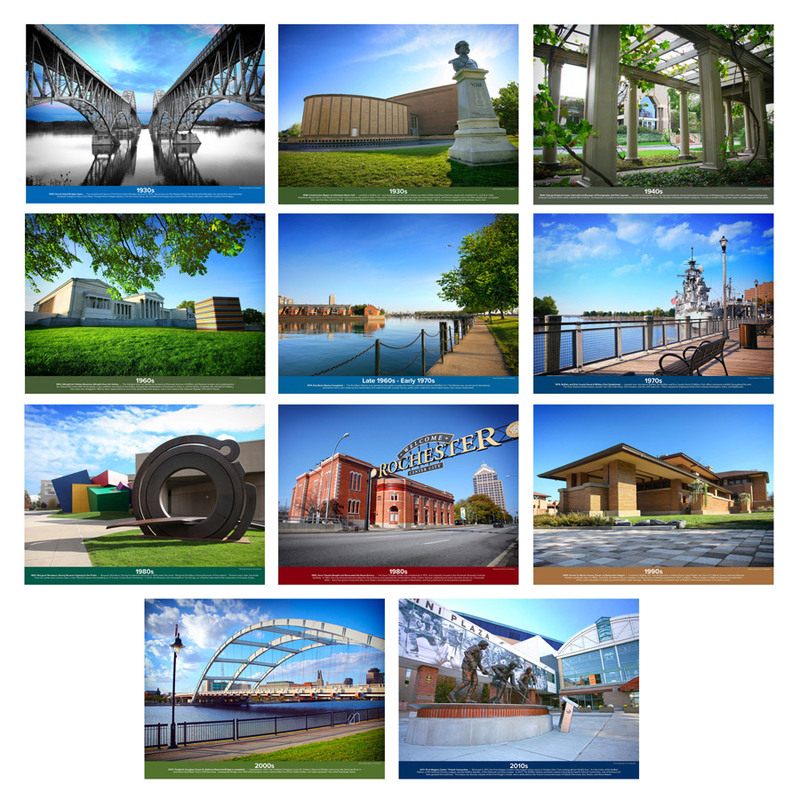 Each of these images I had gone on location around WNY and photographed them. I also color corrected and retouched each image. 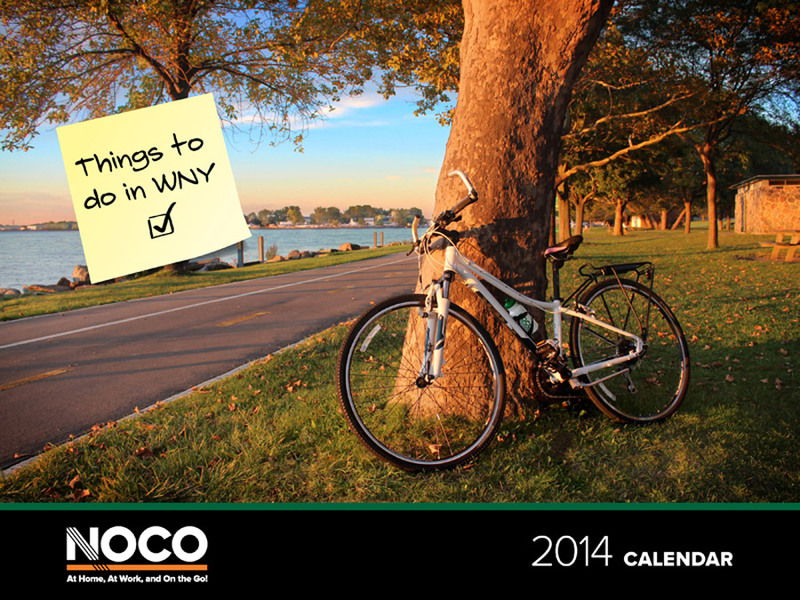 I conducted a brainstorm session, with the Marketing team, for the 2014 calendar ideas, and it was decided to do a theme based on “Things to do in WNY”. From that I developed the calendar to be a “to-do” list for the viewers. Since the theme of this calendar was “Things to do” I run with that idea and created a “to-do” list on the left hand side. I researched events that would happen around WNY, the dates, and places. It was a fun addition and as I was researching them I realized there’s so many things I haven’t done in the area. I had taken these in back of the History Museum in Buffalo NY. 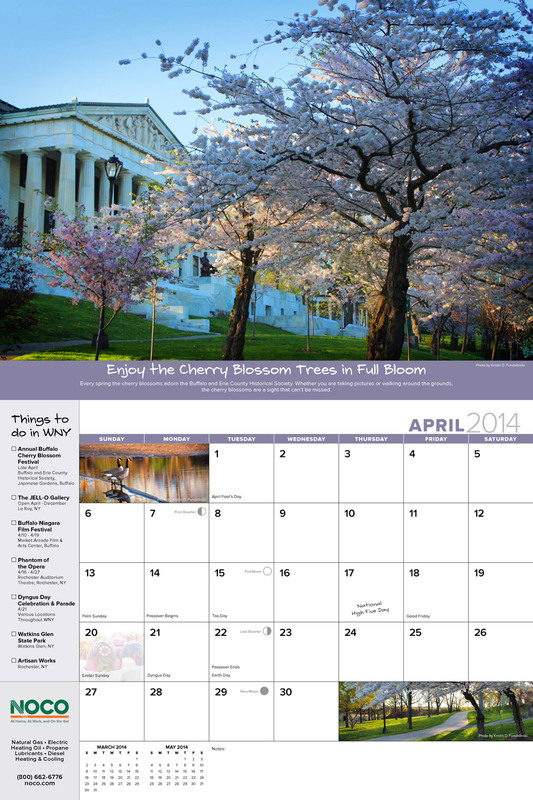 I kept track of when the cherry blossoms would be in bloom and had taken photos for a future calendar, so I was ecstatic that I had the chance to use the photo. 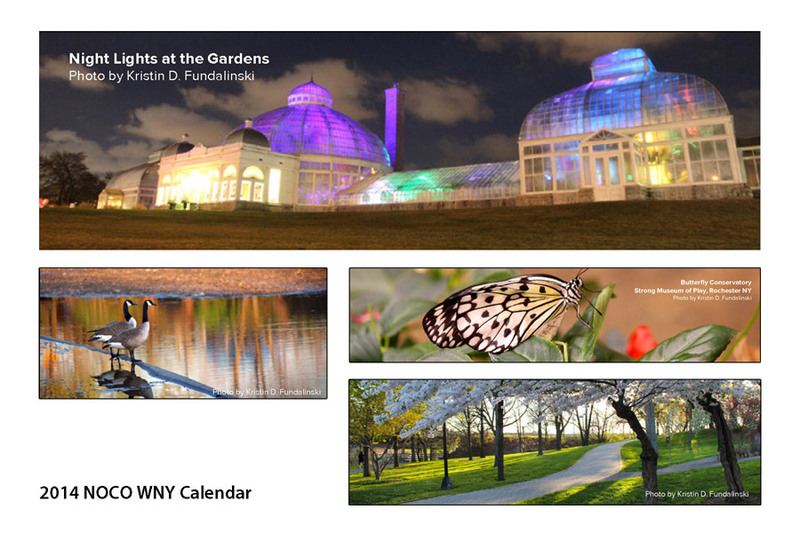 Throughout the months, any open area I placed images from around Western New York, such as the Buffalo Botanical Gardens, Buffalo, and Rochester. Most of these inset photos were taken by me throughout the past few years. 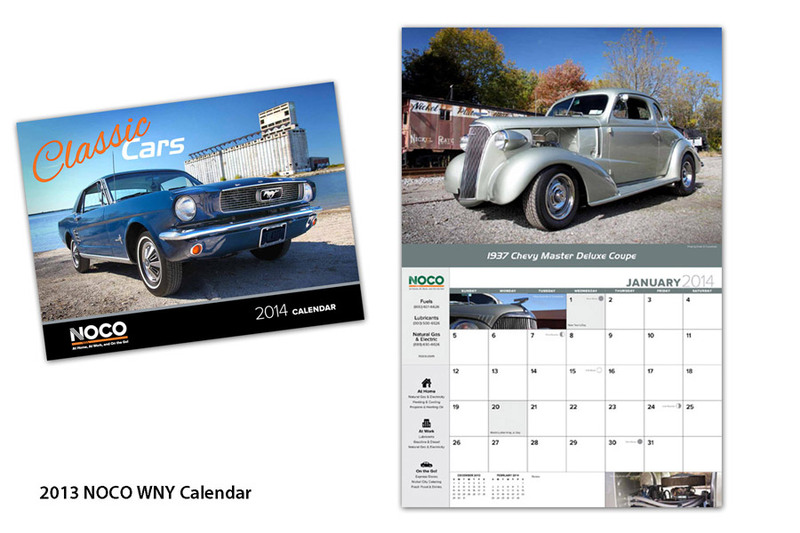 I conducted a brainstorm sessions, with the Marketing team, for the 2014 calendar ideas, and out of that brainstorm came the idea to do a car calendar. 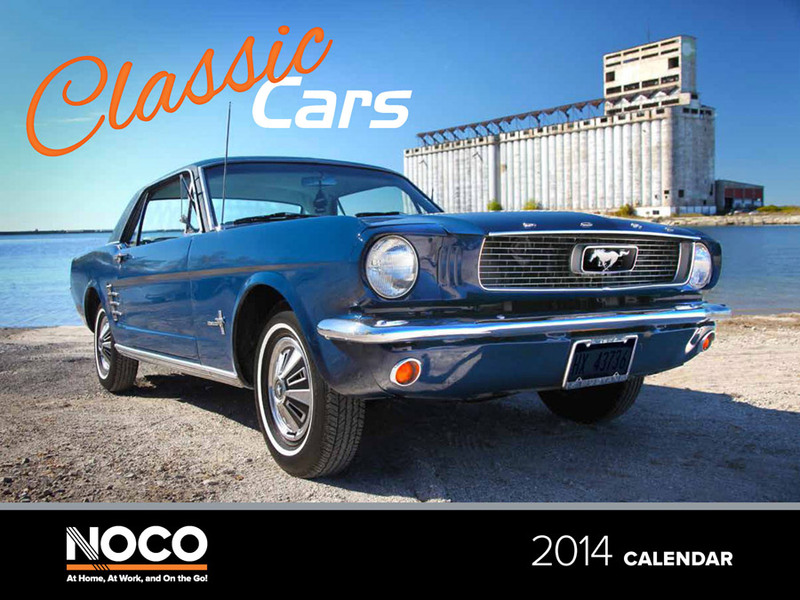 Each month featured a different classic car, and inset images of detailed shots of the cars. This car actually belongs to one of my brother’s friends. We had gone out on a photo shoot around WNY and wound up at the Buffalo waterfront, by the grain elevators. There was a bit of retouching to do in the background as there were unwanted debris around the beach. I tend to have fun retouching and color correcting images. 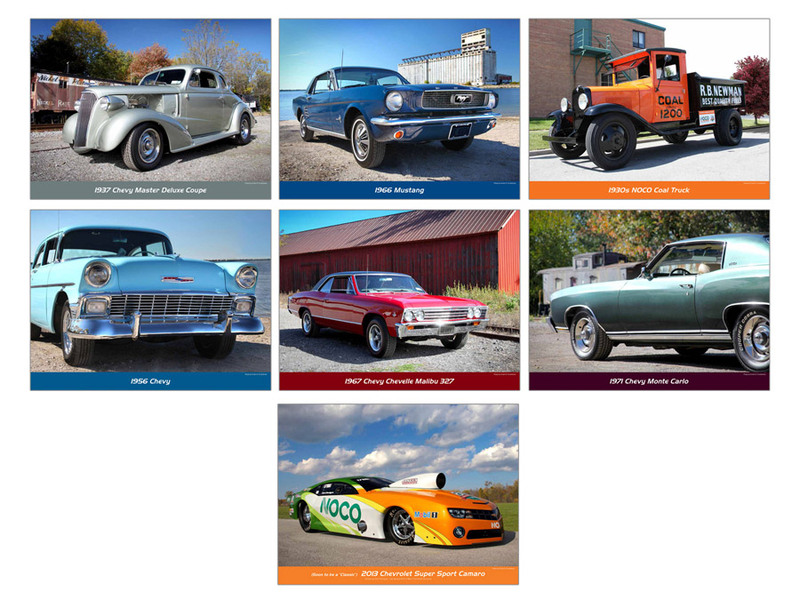 I had photographed 7 of the 13 cars that were featured in the calendar. These photos were taken around Western New York. 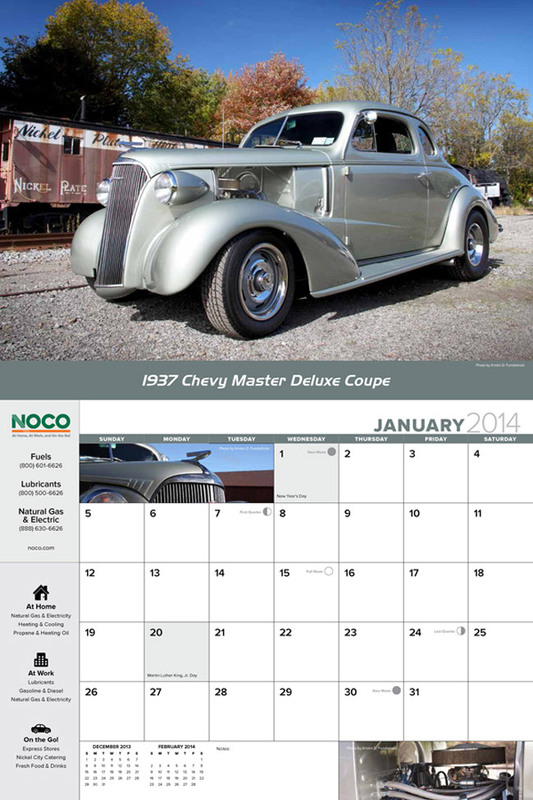 The image on the last page of the calendar is of the NOCO race car. It’s always interesting the looks that happen from people passing by, when taking photos of unique cars.